Its 6:30 p.m. on a Friday night in Long Beach and as I walk from the parking structure towards the newly opened Dog Haus my excitement grows as I begin to hear the crowd chattering, anxiously waiting in line to get in. I finally walk into the small, yet cozy and eclectic establishment. The first thing I notice is the great ambiance the place has, and it's safe to say that everyone in here has at least one thing in common—hunger, and they’re all here to put an end to it and no, a Snickers won’t help. From the need for great quality hot dogs, which our friends on the East coast would approve of, and the value of the food along with the memories that would surge, is how Dog Haus was initially developed by partners André Vener and CSULB alumni Hagop Giragossian and Quasim Riaz. Dog Haus has quickly grown to be a recognized name in the food industry since their first opening in 2010, and have only continued to expand throughout Southern California and others states as well. Being a newbie at Dog Haus the menu can be quite intimidating—in a good way! Though you don’t need a Dog Haus translator to help you decode the menu, you will, however, need to pay close attention to the menu. Remember: you can pretty much upgrade, mostly, ANYTHING! With that in mind and the helpful direction of the staff, wurstmacher and celebrity chef, Adam Gertler, I was reassured with my many, many choices! Although it's quite obvious this place is primarily known for their ridiculously amazing dogs and sausages, many would be surprised to know that they are also home to the best cheeseburger. 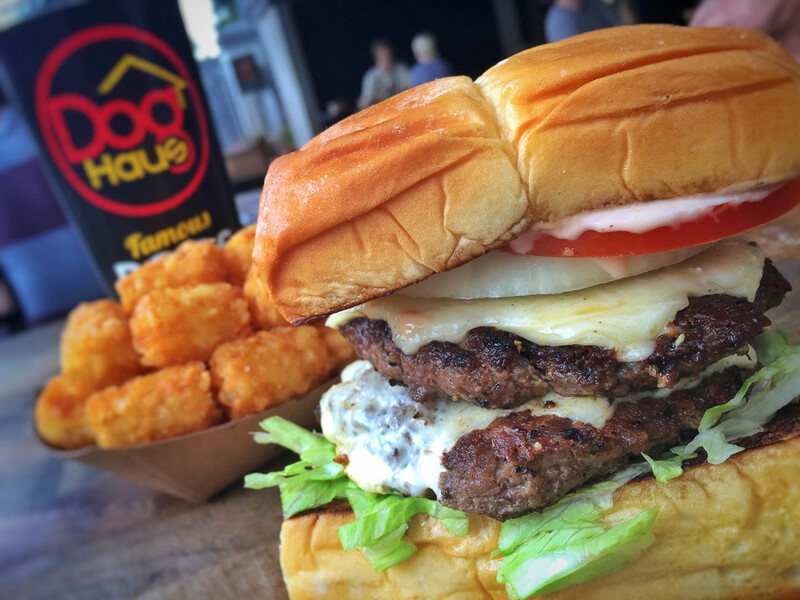 Voted best place for a cheeseburger during the Pasadena Cheeseburger Challenge this year, according to Pasadena Restaurant Week, Dog Haus serves a wide array of diverse, yet familiar burgers with a pleasant twist. Not only do the burgers have clever names like "The Hangover" and "Little Mule" but they also have amazingly clever ingredients that I have no idea how they managed to bring together. But I'm sure glad they did. Now, it's time to talk about the real reason I came to Dog Haus—the hot dogs! I did eat a few: the Scott Bailoi with smoked bacon and a tasteful garlic aioli, the Old Town Dog with a wrapped bacon dog and roasted jalapeños that were a bit too spicy for me (I blame my weak taste buds) and the Downtown Dog that holds your typical mayo, mustard and ketchup—simple yet still a top contender. The Sooo Cali, which is one of their most popular dogs and the first one Dog Haus created, can seem as if you’re getting a great tasting salad with avocado incorporated with your dog. The Grand Slam with the Snap Dog “a play on the Denny’s grand slam breakfast” as Gertler so quaintly put it, has a nice touch with the maple syrup Sriracha and the Snap Dog's herbs and flavors. I also the Bad Mutha Clucka, which had an amazing sun dried tomato aioli with crispy onion and an exquisite delectable sausage that contains lots of ingredients giving it a nice spicy touch. The Fonz, which given by the name you can already guess contains heavy Italian ingredients such as pastrami, spicy Italian sausage and has just the right amount of melted mozzarella cheese. The Das Brat is basically Dog Haus’s version of the classic German bratwurst, which contains parsley, veal, pork with nutmeg, caramelized onions and American cheese. But ultimately, after tasting them all, my heart belongs to the Pig and the Fig. It is a cheese-stuffed sausage topped with fig-onion jam, wild arugula, sliced almonds and whole grain mustard aioli with the perfect balance of sweet and salty to add a special taste that is by far incomparable to any hot dog I’ve ever tasted. With a diverse menu carrying hot dogs, sausages, burgers, sliders, corn dogs and now breakfast burritos (veggie, egg and beef) is there anything Dog Haus hasn’t covered? Well if you’re thinking, what about desserts? They got that covered too! They proudly created their own exclusive ice cream from the famous Fosselman’s Ice Cream Co. and include it in their shakes, floaters and traditional soft serve. Dog Haus doesn’t just house hot dogs, it houses community, memories and affordable delicious food. And in good Dog Haus tradition, it’s safe to say I had the “Absolute Wurst” time here!